This cookie is scratching me right where I itch. Haha! Did that put you off cookies forever? Really though- these are fabulous, and are my new go-to cookie for lots of reasons. Here are some of them! They call for one ripe banana, which is perfect for me because I always have just one- not enough for banana bread. I almost always have all of these ingredients on hand. They don’t have eggs or nuts in them, so they’re safe for babies! They are unspeakably delicious. (As in, Andy and I eat ungodly numbers of them warm from the oven, flecked with sea salt. Little Henry loves them too!) And they’re really unique- I’d have never thought to use curry powder in a cookie, but it’s a lovely little touch that, as gingerroot (the mastermind behind these treats) said, ends up making the cookies taste a bit like gingerbread. Also, they can be very easily vegan-ized by subbing margarine for the butter. Have I convinced you? I hope so. The world should know the glory of these cookies! Cream the butter and sugars together until light and fluffy. Add ½ t baking soda to mashed banana. Set aside for a minute. In a bowl, stir together flour, curry powder and salt. Mix banana mixture into butter mixture. Add vanilla, mixing to evenly combine. Add half of dry mixture to wet ingredients and mix for 10 seconds. Add remaining dry ingredients and mix until just combined, using a spatula to scrape down the sides. Fold in unsweetened coconut. Drop by the teaspoonful on two parchment lined baking sheets, leaving about an inch between each. Bake, one sheet at a time, until golden brown, about 14-16 minutes, rotating the pan once halfway through. 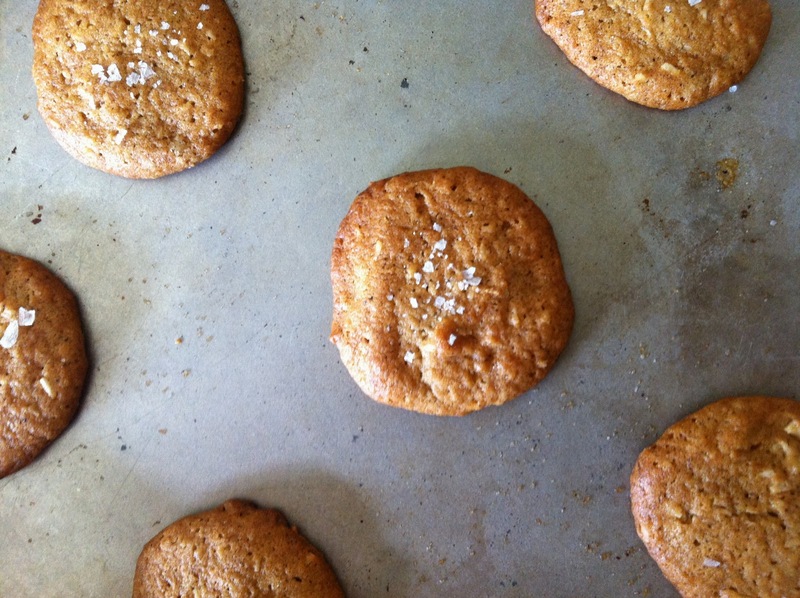 Sprinkle hot cookies with fleur de sel if desired. Transfer to wire racks to cool. Best enjoyed warm.